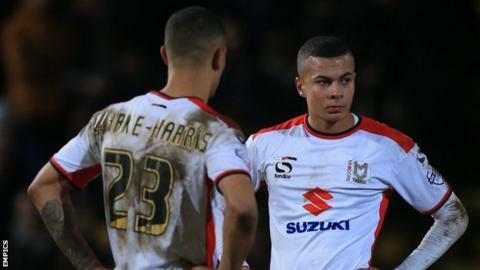 MK Dons boss Karl Robinson has said his players are hurting from the promotion setback they suffered at Bradford City. Monday's 2-1 defeat followed Saturday's goalless draw with leaders Bristol City, who are two points above the Dons with two games in hand. "We're gutted in there. I kept them in longer than usual," Robinson told BBC Three Counties Radio. "A few home truths got said. A few people got told things bluntly. But I could also see the pain in their eyes." He added: "I could see it hurt them. And there are things we can build on." MK are third in League One, with Bristol City and second-placed Swindon Town both able to extend their advantage when they play on Tuesday night. Robinson believes his side have suffered from refereeing mistakes in the last three days, with the Dons having a penalty claim turned down against City and then Jon Stead appearing to handle the ball in the build up to James Hanson's winner for Bradford. "I'm sick of it. I've not come out and said anything about any referee this season. I've been very supportive," he said. "But that's two games on the spin now. "If I moan about it I get told I'm moaning and making excuses, so what's the point? We weren't good enough. But the referee has to be better."